Fall! It’s here, and I love it. I’m Haylee Scott. I own a fabric store called The Stash in the village of Threadville, Pennsylvania, and I sew all year round. But when nights are crisp and days are sunny, I love sitting beside a window and make things from fabric. Besides, we’ve got all these holidays coming up, starting with the biggie for creative folks—Halloween. I’ve stocked patterns, fun furs, and everything you need to make costumes for yourselves and your kids. And you can buy yarns at Tell a Yarn, all sorts of beads and sequins at Buttons and Bows, more Halloween-themed fabrics at Batty about Quilts, and if you want touches of machine embroidery, be sure to visit my friend Willow’s store, In Stitches. Here are a few pointers for children’s costumes, whether you’re making them from scratch, buying them, or putting them together from things you have around the house. 1. Safety is most important. In the excitement of running from house to house gathering candies, kids need to see traffic. Masks might be fun at parties, but consider transforming their faces with makeup for the actual trick-or-treating excursion. 2. Help them be seen. Use light colored or glow-in-the-dark fabrics. You can also buy glow-in-the-dark thread. Incorporate clear or sheer pockets in costumes and insert light sticks in the pockets. Your little goblins and gremlins will love their spooky glow. 3. And then there’s comfort. Depending on where you live, Halloween can be cold. You don’t want to cover the fabulous costumes you create with coats, so make the costumes roomy enough for your little trick-or-treaters to wear warm sweaters and/or jackets underneath them. Stock up on clear plastic ponchos in case it rains. It better not! And here’s a tip for those kind people who stay at home and answer the door—praise every costume. The pleasure you’ll give the kids may last longer than the candies. What fun costumes have you made or worn? You can learn more about Haylee and how she helped Willow catch a murderer in DIRE THREADS, available in stores everywhere. I cannot resist a fabric store... it is a pleasure just to walk through and wallow in all the beauty! What do you think about how adults have taken over Hallowe'en, Haylee? You could probably make a bundle off adults wanting to make their own costumes! This is brilliant, Haylee! I will be passing it on to friends and family. Thanks so much for a terrific post - wish I could get to your shop. 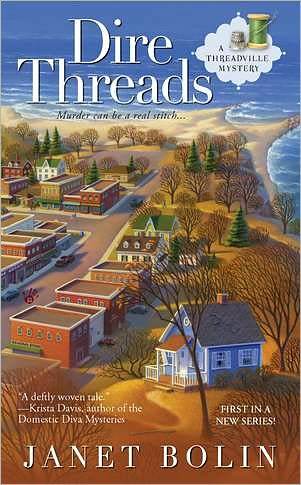 I loved Dire Threads! I used to love the costume my Mom made me for Hallowe'en...even the ones she just threw together. And you're right, kids love it when you gush over their costumes while handing out the stash of treats. I should send you a picture of a Halloween costume I made for my daughter one year when I was out of work and had too much time on my hands--it's pink and black satin, with beading (she was a princess). Or her first costume, when she was a fuzzy Siamese cat, complete with a long tail. Hi, Haylee. I used to love to make costumes for my son. He loved to be a super hero, so we made tons of capes! But before he was a super hero, he wanted to be Mickey Mouse and I had my most fun figuring out the costume for that. Love Dire Threads! Can't wait for more Willow and Haylee adventures. I love fabric stores, especially when I'm thinking of my next quilt project. I don't sew much, but somehow, fabric stores make me think anything is possible! BTW, I love your pumpkin! And yes, Victoria, grown-ups love to dress up in costume, too, and everybody, kids and grown-ups are becoming more creative. Last year, I asked one teen what she was supposed to be. The answer? A dead bride. I was a little startled, as you can imagine.